Adapted from M.L. Stedman's bestselling novel by Blue Valentine director Derek Cianfrance, The Light Between Oceans is the melodramatic story of a married couple whose lives are turned upside down by a single, life-changing decision. Michael Fassbender plays World War I veteran Tom who, traumatised by his experiences, relocates to become a lighthouse owner on the remote Australian coast where he eventually marries Isabel (Alicia Vikander). Unable to conceive children, they consider themselves blessed when a young baby washes ashore in the wake of a wreck - but their decision to raise the child as their own has drastic consequences when a woman played by Rachel Weisz enters the scene many years later. With its heavyweight pedigree of A-listers and director, The Light Between Oceans also gets another noteworthy injection of class in the form of composer Alexandre Desplat. Cianfrance had been looking to collaborate with Desplat on his previous two movies but scheduling conflicts prevented it; one suspects the outpouring of emotion in Desplat's score is not only a reaction to the story itself but also a cathartic release at finally being able to work with the filmmaker. Make no mistake, after a relatively quiet 2015 and 2016 (bar The Danish Girl and The Secret Life of Pets), the Desplat we know and love is back in full force, once again demonstrating that he is unrivalled in the realms of sophisticated drama scoring. 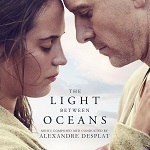 Beautifully nuanced and intelligently constructed, taking the listener on a clearly defined journey from romance through heartbreak and despair to eventual salvation, The Light Between Oceans stands proud with Desplat's other dramatic classics like The Luzhin Defence, Birth, The Girl With a Pearl Earring, Lust Caution, The Tree of Life and The Painted Veil. Desplat affords a theme to each of the story's main players - Tom, Isabel and their adoptive daughter Lucy Grace - with Isabel's piece acting as the sumptuously flowing main theme that recalls John Barry and Georges Delerue at their finest. It's this overrarching piece that opens the score in 'Letters', one showcasing all the familiar, warm Desplat mannerisms: precision-honed piano melody atop a dainty bed of fluttery strings that is gradually bolstered by further input from the smoothly flowing woodwind setion; by this stage Desplat has honed such a recognisable musical voice that his style is unmistakeable, but what's really impressive is how he continues to wring so much variety out of it. The piece is treated to any number of outstanding variations from the awed strings of 'At First Sight', where it hovers on the cusp of something truly revelatory to the gorgeous, piano-led 'Isabel' (performed by Vikander in the movie itself). It then takes a backseat for much of the score's mid-section, appearing largely in fragments before its breathtaking, redemptive final statements in the climactic 'Each Day We Spent Together', 'To Be Loved' and, especially, the heavenly climax 'The Light Between Oceans' where it attains a measure of beauty impressive even by this composer's formidable standards. By bookending both ends of the score with Isabel's main theme, Desplat clearly structures the score around the emotional journey of her and Tom, beginning the album with the first stirrings of love and ending with a newly attained sense of emotional maturity. In-between there is the theme for Tom himself, a far more stately and imposing piece swirling with hidden darkness befitting the character's troubled nature. First introduced in 'Tom' it unsurprisingly carries with it the understated yet purposeful tones of the 'Fatherhood' material from The Tree of Life. This theme is then developed in conjunction with Isabel's theme, making noteworthy appearances in 'To Resent', the hugely dramatic 'Janus' (one of the score's highpoints), 'A Wonderful Father' and 'Still Your Husband'. By playing off Tom's more challenging material against the more lyrical Isabel's theme, Desplat grants us a musical depiction of love's complexities from its highs to its lows. In-between is another genuinely affecting theme for 'Lucy Grace', the child whom Tom and Isabel rescue from the sea. The carefully undulating piano theme that Desplat introduces is a thing of wonder, nothing less than childhood innocence personified; it's breathtaking music and another key component of the score's fluid movement between light and dark. On the latter point, the difficulties our characters face are rendered in uncompromisingly dramatic terms in tracks such as 'The Dinghy' and 'The Rattle', brooding bass and plucked strings carrying with them a palpable sense of despair. The flipside comes in the glorious 'In God's Hands', piano attaining a more whimsical quality prior to a breathtaking woodwind interlude in the second half. 'Path of Light' is deeply profound, a melancholy and stately inversion of Isabel's theme that bespeaks a growing sense of self-awareness and the complexities of human existence; that Desplat is able to make his music ripple with such undercurrents is testament to his talent. The burgeoning strings towards the end of the piece appear to be leading us towards some kind of catharis but the ensuing pieces 'The Return' and 'Hannah Roenfeldt' pull us back in a more uneasy, unsettling direction. Prickly harp scales, grinding strings and bass communicate the unexpectedly tragic outcome of Tom and Isabel's decision, the string section often swirling in despairing fashion like waves on the sea. By contrast the heartfelt 'To Forgive' is similarly thoughtful but in a subtly more optimistic way, glockenspiel lending a more featherweight and appealing air to the music, yet it's only a tentative step towards the light. As previously mentioned everything resolves in the stunning climactic track 'The Light Between Oceans', one final statement of Isabel's theme that is as calming as the sound of the morning surf; the gentle interaction between strings and piano (with an especially florid flourish around 3:30 in) would have made romantic master Georges Delerue, a clear influence on Desplat's works, proud. Alexandre Desplat's scores have often invited criticism from film music fans for seeming cold and aloof, lacking in emotional impact. Whilst it is true that his approach and orchestrations place emphasis on crisp precision and an almost metronomic sense of timing, he is a composer whose music conceals hidden depths; even when skimming along the surface, there will often be a counterpoint or musical nuance that deepens our emotional understanding of the track in question (and, most crucially, our understanding of the movie scene the music accompanies). The Light Between Oceans demonstrates this perfectly, taking us on a clearly defined journey through romance and heartbreak and out the other side. Many movie reviewers have critiqued the music's role in the film itself as sentimental but Desplat's music is rarely that; there's always a sense of rigour and control that is quite captivating to listen to, never devolving into easy schmaltz. Even so this must be one of his most emotionally direct scores to date, overflowing with lovely melodies and establishing itself as one of the year's finest. The music score album is available on CD, on Vinyl, or as an MP3 download at these links: Amazon.co.uk or Amazon.com.